When the idea of "chasing" tenants (post move-out) for the money they owe, many questions come to mind. Here are the answers to some. #1. Is there really any money in this? I've had many landlords tell me "there's no money in the pursuit of past tenants and their outstanding charges". We bought that argument for the first 20 years managing rentals and finally decided to try out something new. We're thrilled that we finally took the plunge. The first five years weren't so productive, but once we got through our learning curves we really began to cash in. 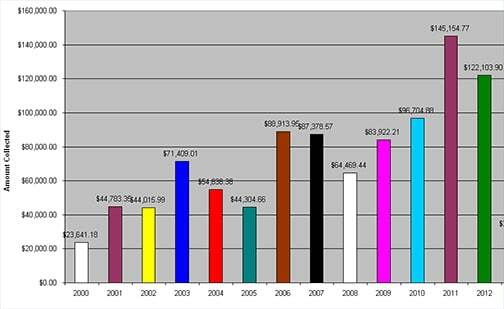 Here is our gross revenue chart for our 12-year experience. There are several things you need to know to properly interpret this data. We were managing 300 properties in 2000 when we started this business. Many of the strategies we put in place initially didn't pay off for two to three years. People in financial trouble recover over time and if you implement our system, you'll put a lot of money on the table that won't show up for several years. Conclusion: the first two to three years won't be an accurate reflection of the success of your efforts. We didn't have much time to dedicate to another business. We were running a growing property management business and our schedules were pretty full. Throughout this 12+ year period, I personally allocated 3-5% of my time to this venture as the owner and my assistant gave 10-20% of her time. This is a very part-time business you run with a staff member out of your management company. Some years we set it aside in favor of other priorities and other years gave it more attention. It clearly is a sideline business you can manage with spurts of energy from time to time as your calendar allows. Many months we'll do nothing but answer a few calls and cash some checks. In March of 2011, we broke $1,000,000 of collected monies. Today it's far more than that, plus we manage a ton of Promissory Notes and Consent Agreements that bring in $9,000 - $12,000 a month. Not bad for a part time sideline business. It would be double these amounts if we'd known what we were doing in the beginning: a story you won't repeat if you align yourself with us and learn from our mistakes. Profit margins in the business range from 70% to 80% of gross revenue. #2. Don't the people get mad at you when you're chasing them for money? Not nearly as much as they do in property management. Rent recovery is a lot easier than property management when you set it up the right way. We find tenants are much friendlier than they were when they rented from Crown. If you're afraid of people getting mad at you, get out of property management and into rent recovery. #3. I already have a full-time job. How much time will this activity take? As the owner of our management company (and our rent recovery company), I spend 3% to 5% of my time in rent recovery. Months go by when I do nothing. My assistant spends 10% to 20% of her time with letters, record keeping, phone conversations, accounting and court visits. Some months she does nothing but deposit checks. This is NOT a time consuming business once you get it set up. #4. Will this business get me into a bunch of lawsuits? Over our first 11 years we averaged about $1,500 a year in attorney fees. We collected our first $1,000,000 spending less than $15,000 on lawyers. Occasionally a tenant would have an attorney respond to our pursuits, but they usually retreat with a thoughtful response. When our response doesn't work, we have our attorney respond. Most of them are just huffing and puffing, but we'd have our attorney substantiate our claim and they go away. Our letters, procedures and documents were set up just right and to date, we have never been countersued. As we all know, you can be sued for anything by anyone. If you're timid about being sued, get out of property management immediately. That being said, in 2012 an ambitious attorney (representing a tenant owing $1,500) thought we were violating the Fair Debt Collections Practices Act and filed a Class Action Lawsuit against us. Our E&O carrier stepped in and managed the claim. It took the attorney six months to figure out that we were innocent of all their frivolous allegations and we settled. Three class members shared $2,800 and we paid half our deductible to the E&O company. It was a great learning experience, as we found some holes in our system that our defense attorney helped us tighten up. We've now opened another rent recovery business (closing the old one down) and jumped back in the business with more fervor and boldness than ever. With our system examined carefully by the attorney who defended us (a debt collection expert), and this one lawsuit behind us, we're more confident than ever that we'll avoid litigation in future years. You will too if you adopt our system. Can you get sued? Of course you can, but working with Rent Recovery will substantially reduce your prospects for litigation as you will have our experience, letters, forms, checklists and attorney oversight to set your system up just right. Property management is a lot more litigious than a post move out rent recovery business. Even with this action against us, we've collected $1,400,000 in 12 years and have spent less than $25,000 in attorney fees and E&O deductibles (less than 2% of gross revenues) and most of it spent on one frivolous action. Running your rent recovery business properly, right from the start, will substantially reduce your chances of litigation, but no one can remove the possibility all together. If you want no chance of getting sued, get out of property management. Rent recovery is a lot easier and less litigious. #5. How much legal experience do I have to have to make this work? Absolutely none!! We are property managers. Not paralegals, not lawyers, and other than some eviction experience, we came into this business as complete novices. As professional property managers, you already know small claims (eviction) court where you'll make your case for unpaid charges after move out. We almost never use an attorney because it's all done in small claims court. #6. If professional debt collectors don't succeed at collecting from past tenants, why should I believe I can do any better? There are several reasons why professional collection agencies aren't successful collecting on past tenants. First, collection companies work from distant locations, chasing debtors from their desks with letters and verbal pressure as their only strategy. Landlords are boots-on-the-ground resourceful players with a copy of an executed lease, move-out inspection, photos of damages, payment ledgers, and with these tools (and a little training), you can be far more effective than 3rd party collection agencies. Second, collection companies traditionally collect on credit card charges, for money spent on consumer goods, college tuition, and medical expenses. They have no relationship with the debtor and little documentation as to how the charges accrued. Landlords have an executed lease, a contract listing rent and other charges they can prove the tenant owes. Real estate contracts are viewed by judges as real, concrete, and tangible, and are much easier to get the courts to enforce than consumer debt. Present a lease to a judge with a list of unpaid charges, property damage, and photos and you'll have a very different outcome than people chasing credit card debt from their desk in Montana. If a landlord or professional property manager makes just a little effort to pursue these delinquent balances with the strategies we've developed, tenants generally pay sooner or later. Third, they won't take your file, attend court and substantiate the claim to the judge. Debt collectors don't know what we know and want to do their job from their desk. Last, debt collection companies are not typically long-term thinkers. The idea of staying on top of (tracking) unpaid balances for several years is too much work. They want to harvest the "low hanging fruit" (easy money) and let the harder accounts slip away. They want to push hard for three months and see what they can get. The idea of a marathon over two to five years doesn't fit their model. They're sprinters, not marathon runners. Professional property managers are patient, resourceful, residual income builders, and can be far more successful at collecting on their own accounts than professional debt collectors. Our mission is to leverage our 12 years of experience, and all the lessons we've learned, to help you do this just right from the start so you can enjoy the profits without the expense of the learning curves we've paid for. #7. Do I need to open a separate company to do my rent recovery collecting? You don't have to... but you should. We began our pursuits business inside our management company in the beginning and we wish we hadn't. It took us several years to experience the affects of our mistakes before we got smart and opened a separate company. We'll help you think this through and make the right decision for your company. #8. How do I get started? 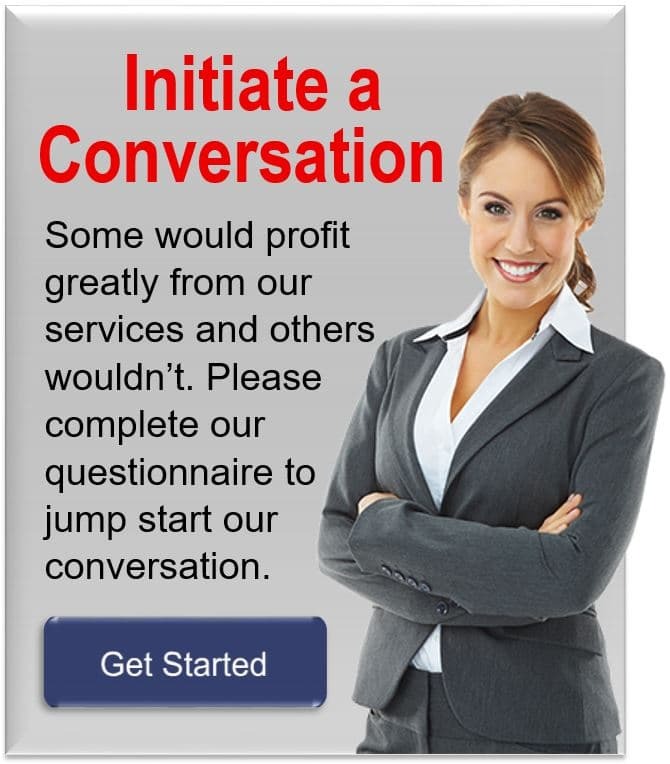 To initiate a conversation with Rent Recovery, you must complete a short questionnaire on this website to give us an idea of who you are and how far along you are in the property management business. Some managers should not start a rent recovery business. We'll help you think this through.